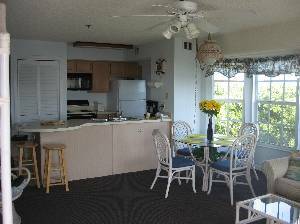 We are offering for rent our beautiful, 2BR/2BA condominium located directly on the ocean in Key Largo (Tavernier), Florida. As this is a top floor, "END" unit there are many windows that provide an open, bright feel and offer views of the ocean throughout the condo. The location provides direct ocean access in one of the finest diving and fishing areas anywhere. Incredible diving experiences are available at John Pennekamp Coral Reef State Park only minutes down the road. Fishing trips of all types are widely available, especially in nearby Islamorada. There are two tennnis courts next to our condo, free of charge for guests. The heated pool is just a short walk, visible from our condo. 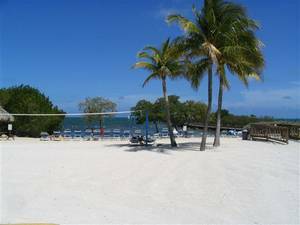 The beach pictured is within the gated community, only a 5 minute walk. There is a elevator in the building and laundry in our condo. 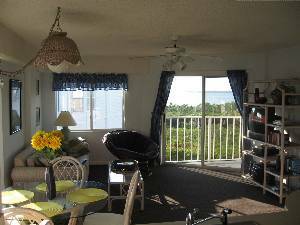 * Cafe/Bar located at the Marina, an internet "Hot Spot"
The master bedroom features a king-size bed, plenty of closet space, TV, bathroom, and an open ocean view through the large bay window. 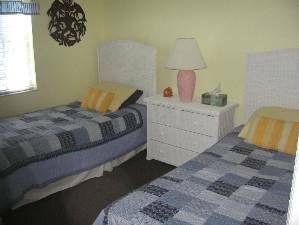 The second bedroom has two twin beds, closet, and a bathroom with a whirlpool tub. The fully-equipped kitchen offers ocean views through the large sliding glass door and the bay window. The living room has a sleeper sofa, color TV with VCR & DVD, CD stereo, comfortable seating and access to the balcony through the sliding glass door. A dining table takes advantage of the ocean view through the large bay window. 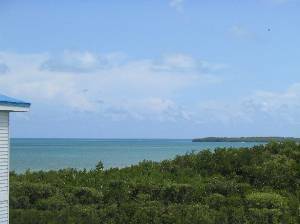 Come stay with us and enjoy the fabulous Florida Keys! Diving/Snorkeling at John Pennekamp Coral Reef State Park. 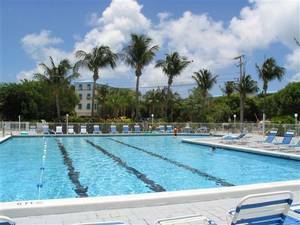 One of the largest pools in the upper keys a short stroll from our condo. 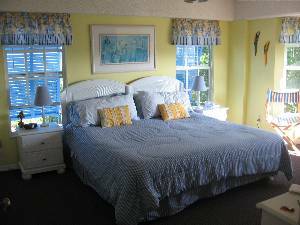 King bed with views of the ocean from the large bay window. The beach within our gated community, about a 5 minute walk from our condo. A view of the ocean from the balcony. Our condo, top floor far left unit. View of our kitchen and dining area from the balcony. We had an awesome time, your condo was perfect. The weather was beautiful as well as the scenery. We will definitely contact you for future vacations. Thanks again. Thanks so much for letting us rent your condo. We LOVED it, and found it very comfortable, clean, safe, and private. If we ever return to the Keys again, we will definitely want to stay at your place! Your condo was perfect--I appreciate how smoothly everything went. We really enjoyed your condo, and will especially miss our favorite breakfast sunrise spot with ocean views all around. Just a short message to say that we thoroughly enjoyed our stay at your condo and the facilities in your complex. We had a good time. We made use of the tennis courts and pool quite a bit. We also had a nice family picture taken on the pier. The condo was very nice and quiet. We will recommend people to your condo. 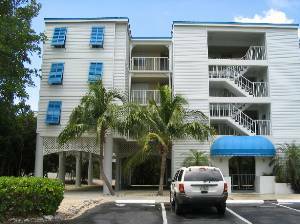 We had wonderful holidays at your condo in Tavernier. We discovered the Keys with great pleasure and we intend to return as soon as possible. We had a marvelous vacation at the condo. Everything was fine and we enjoyed every minute. We got home late last night. We'll seriously consider doing it again at this time next year! The boys and I had a great time. Attached is a photo of them getting to know a dolphin. Just wanted you to know that our vacation was great--wonderful time, wonderful weather and a wonderful condo! The views are amazing and your place is very comfortable and it has everything! We enjoyed the pool and the marina and of course, the bar upstairs! We have rented several places in Florida and I would have to say, your place is really stocked with everything we would need. Thanks again and if we think about the Keys next year, we will definitely give you a call! !